At the moment I have 83 places saved on my To Eat list. Everyone has one. The problem for me though is that a good half of those places are way out of my budget so therefore I will probably never gonna go. But a good handful, I’m sure I will..someday. Like just few days ago, I was able to cross off 2 from the list. Cheeky Sandwiches (which I’ll post about later) and Shu Jiao Fu Zhou Cuisine. Funny thing, I have walked by Shu Jiao Fu Zhou Cuisine so many times but never once did I think to go in. It took someone else to write about it, then I read it and then found myself looking for it after eating at Cheeky Sandwiches. They’re known for their fish balls, heck “fish ball” is part of the name but since I already ate, I decided to get a plate of their rice noodles with peanut butter sauce. 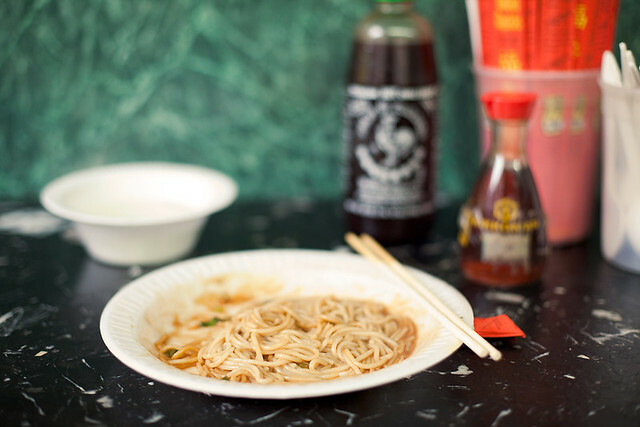 For $2, you get a plate of warm slightly chewy rice noodles with peanut sauce on the bottom and a bowl of soup. The peanut sauce was really nice and definitely loved the chewiness of the rice noodles. I never had this dish, warm, it is always cold or at room temperature but it was delicious.